Fuglafjørður (Dens: Fuglefjord) is a veelage on Eysturoy's east coast in the Faroe Islands. Its name means "fjord o birds". The veelage is situatit at the edge o a bay an expands intae the surroondin steep hills. The toun centre is locatit close tae the harbour an contains maist o the shops an services. The harbour in Fuglafjørður is busy, as the toun's economy is based on the processin o fish an fish meal. There is fishin-industry, a slip, production o trawl an an aa ile-depots. In the 1970s there wis a terrible stink frae the fishin-industry but that haes syne been solved. In the past years Fuglafjørður haes an aa become famous for its newly established cultural centre in the toun centre that haes become ane o the main cultural attractions in Eysturoy. Whaur the Gjógvará stream meets the sea in the veelage, airchaeologists hae discovered the remains o a Viking langhoose, seiventeen metres in length, wi waws 1.5 metres thick. It wis foond bi remuivin fower or five mair recent layers o ruins, showin a continuity o habitation for mony centuries. 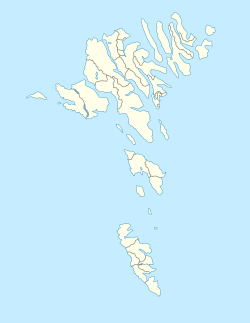 In the 1840s the sma veelage Hellur in north o Fuglafjørður wis established. Housomeivver this veelage never grew lairge an nou anerlie approximately 30 o the municipality's inhabitants live there. In the 1980s the suburb o Kambsdalur wis established, an nou aboot 180 o the population in the municipality live here. In Kambsdalur there is an aw a lairge industrial cluster, the educational centre o the northeastren Faroes an the regional sportscentre uised mainly for handbaw, volleybaw an indoor fitbaa. ↑ 1.0 1.1 Brandt, Don (2006). More Stamps and Story of the Faroe Islands (pdf). 1. Tórshavn: Postverk Føroya. p. 45. ISBN 99918-3-191-6. Retrieved 2008-09-04. Faroeislands.dk: Fuglafjordur Images an description o aw ceeties on the Faroe Islands. Wikimedia Commons haes media relatit tae Fuglafjørður.